We’d love your help. 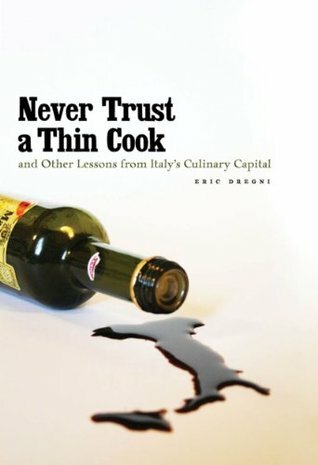 Let us know what’s wrong with this preview of Never Trust a Thin Cook and Other Lessons from Italy's Culinary Capital by Eric Dregni. I simply want to live in the place with the best food in the world. This dream led Eric Dregni to Italy, first to Milan and eventually to a small, fog-covered town to the north: Modena, the birthplace of balsamic vinegar, Ferrari, and Luciano Pavarotti. Never Trust a Thin Cook is a classic American abroad tale, brimming with adventures both expected and unexpected, awkward social moments, and most important, very good food. Parmesan thieves. Tortellini based on the shape of Venus's navel. Infiltrating the secret world of the balsamic vinegar elite. Life in Modena is a long way from the Leaning Tower of Pizza (the south Minneapolis pizzeria where Eric and his girlfriend and fellow traveler Katy first met), and while some Italians are impressed that "Minnesota" sounds like "minestrone," they are soon learning what it means to live in a country where the word "safe" doesn't actually exist-only "less dangerous." Thankfully, another meal is always waiting, and Dregni revels in uncorking the secrets of Italian cuisine, such as how to guzzle espresso "corrected" with grappa and learning that mold really does make a good salami great. What begins as a gastronomical quest soon becomes a revealing, authentic portrait of how Italians live and a hilarious demonstration of how American and Italian cultures differ. In Never Trust a Thin Cook, Eric Dregni dishes up the sometimes wild experiences of living abroad alongside the simple pleasures of Italian culture in perfect, complementary proportions. To ask other readers questions about Never Trust a Thin Cook and Other Lessons from Italy's Culinary Capital, please sign up. Was interesting, but didn’t capture my imagination the way that great travel writing does. The author convinced his girlfriend to live abroad with him for 2 years. This enjoyable book with 47 short stories explains life in Italy. Very enjoyable. It was cute, and had many interesting points on the nationalism and characteristics of the country. The nuances of our countries and our differences was particularly interesting. The food! oh, the food! how important it is to the culture and the lifestyle, just simply makes me wish I knew how to speak Italian, and could visit. Read it because it's short and the publisher sent me a free copy. At first I thought, these are just anecdotes. But then I realized, great! these are anecdotes! It's an easy read with the author's standard sense of the absurd and obvious love of his characters. I laughed out loud, occasionally, on the bus. Slow going with this one. There are a number of words in Italian with definitions in the back to look them up. I really liked this book. I will forever appreciate good (Italian)food and good wine from now on. Funny and enjoyable to read -- but it's making me reconsider my fantasy decision to move to Italy to instead just frequenting a really good Italian restaurant. Entertaining and also about food. Delicious. Insight into the quirks of living in Italy and more specifically Modena. Always good to support a local author. This is a fun description of the author's two years in Modena, Italy, highlighting food and cultural differences. A good light read.